Islamic State militants have locked Palmyra's museum and placed guards outside its doors, days after seizing the ancient city, Syrian officials say. Antiquities director Maamoun Abdulkarim said they had destroyed some modern plaster statues and also raised their flag on the ancient castle overlooking the Roman ruins. Most of the museum's antiquities had been transferred to Damascus, he said. 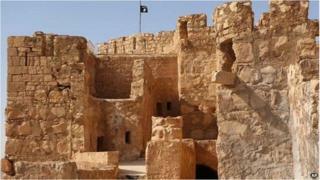 IS has previously demolished ancient sites that pre-date Islam. It sees this as a war against "false idols". The capture of the World Heritage site next to the modern city of Palmyra has raised international alarm. UN cultural organisation Unesco says its destruction would be "an enormous loss to humanity". Some may find it distasteful that many seem to be increasingly inured to the human toll in Syria, while interest is piqued by attacks on historical sites. Doubtless, they might prefer that some of the yardage given over to glossy pictures of Palmyra in its glory days be given over to reporting of the day-to-day devastation faced and experienced by ordinary people. It must be remembered that there are rarely mutually exclusive choices here. The loss of Syria's cultural heritage represents the loss of far more than some tourist attractions - it is the loss of connection between multiple generations. The words written and arguments elucidated over the importance of saving cultural heritage sites are also a part of wider discussions and pressure to cobble together anything approaching a meaningful plan to intervene or otherwise halt the worst excesses of the violence in Syria. The fall of Palmyra came just days after IS captured the major Iraqi city of Ramadi. Citing Palmyra residents at a news conference in Damascus, Mr Abdulkarim said IS militants had entered the museum on Thursday breaking "some plaster statues... being used to represent life in prehistoric eras", before returning on Friday to lock it and place guards at its doors. Media captionWhy does IS destroy ancient history? "There's almost nothing left in the museum, we had been progressively transferring the antiquities to Damascus," he said. "We feel proud as all the museum's contents were taken to safe areas," Mr Abdulkarim told reporters. IS militants have destroyed several sites in Iraq - most recently the ancient city of Nimrud, one of Iraq's greatest archaeological treasures. They are also reported to have burnt down Mosul Library, which housed over 8,000 ancient manuscripts, and used sledgehammers to demolish statues at a Mosul museum and at an archaeological site known as the Nergal Gate.